A funeral for a friend or loved one can be difficult, but nothing can help the healing process quite like funeral flowers from Cole’s Flowers of Middlebury, VT. Affording you the opportunity to express how much the departed means to you, funeral flowers let you celebrate the life of your loved one. 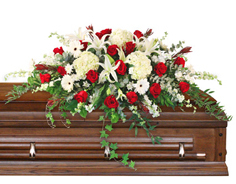 Offering a variety of beautiful funeral flower arrangements Cole’s Flowers is your top resource at such a difficult time. 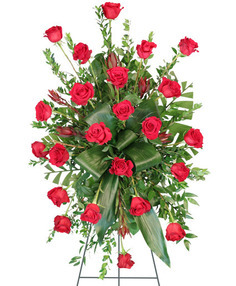 Our choices include the Classic Remembrance Urn, Mixed Flowers Sympathy Tribute or one of our standing sprays. 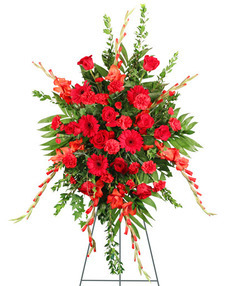 Browse our selection for the perfect sympathy arrangement and place your order online. You can also call and speak with one of our designers for custom funeral flowers just as unique as the life your loved one lived. We specialize in funeral flowers, and particularly in standing sprays. So we can create the perfect memorial for your final tribute and accurately follow remembrance etiquette. Order your floral standing spray online or call us to add any custom elements to more accurately represent the life of your loved one. A neighborhood fixture in Middlebury, Cole’s Flowers can create any arrangement you could possibly imagine. Our arrangements can be as unique as the style and personality of your departed loved one or classy as a black tie event. We also take great pride in our memorial flowers for cremation services. Flowers show you care when your friends are going through tough times. 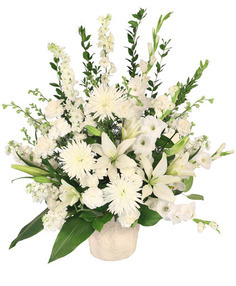 The perfect way to say you’re thinking about someone going through a time of grief, custom sympathy arrangement from the heart are sure to let your loved ones know just how much you care. You can also choose from the 17 classy and moving template designs which helped build our reputation in the area. 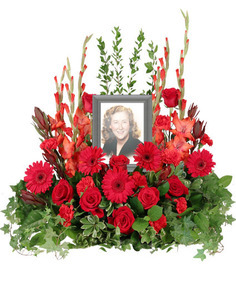 Our template sympathy creations include everything from sunflowers, orange roses, snap dragons and pink pale lilies. We also offer the “Red White and True Blue” memorable arrangement for our veterans. Don’t look any further when looking for a sympathy arrangement, as Cole’s Flowers of Middlebury will work closely with you on whatever your floral needs may be. Flowers serve as an inspiration and a tribute to friends and loved ones during trying times. Cremation urn and memorial flowers can act as a personal expression of love or as a warm send-off. When you work with COLE'S FLOWERS, we endeavor to illustrate the essence and memory of your loved ones with a beautiful floral expression of their lives. Our selection of floral inspiration covers a wide variety of personalities and tastes. Looking for something different, or want to add a personal touch? We also do custom arrangements. Call for pricing.